One is guilty, but all are responsible (to paraphrase Rabbi Abraham Joshua Heschel). 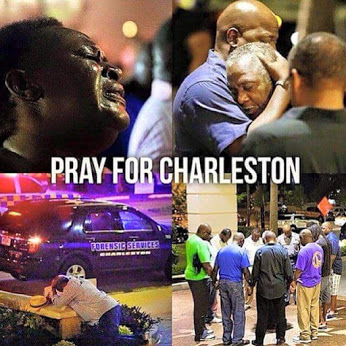 I awoke Thursday morning to the news of the tragic deaths of the nine people of Emanuel AME Church in Charleston, SC. Their only “crime” according to Dylann Roof, their killer, was that they were black. As a white person who does not share Roof’s racist views, I would like to believe that his action was a random act of violence at the hands of a troubled and deranged young man; that way I could go on feeling sad but free of any responsibility. Yet I know it is not that simple. The tragic events of Wednesday night are only the most recent example of how tenuous life is for those who are black in this country. Going back nearly 400 years when African slaves were first brought to North America and the hundreds of years of torture and humiliation they endured, through the Jim Crow era and the lynchings, through the time of bombs, dogs and hoses of Bull Connor’s Birmingham to the unnecessary deaths of Trayvon, Michael, Eric, Tamir, Freddie and so many unnamed more at the hands of police brutality, to the recent tragedy in Charleston, the safety, security and mere livelihood of black people in America has been fragile and tenuous. I know that intellectually, but I have no idea what it is like to live in an environment where at any moment – even in a church at a Bible study – you could be gunned down; I can’t even imagine. At its root the word “compassion” means “to suffer with” and to the extent I am able, I suffer with those who knew the victims personally or indirectly, and I suffer with those who experience these murders as a reflection of their own grief and suffering. Yet as a white person I can only approximate that suffering in a small way. Even if I were to change my skin color like John Howard Griffin (author of Black Like Me), or seek to pass as a black person like Rachel Dolezal, I cannot know what it is like to have the color of one’s skin be the sole characteristic that some use to judge whether or not your life has value. Black lives do matter not more than others, but as much as others. That is not a given in this country – that much I have come to understand, and to my limited ability to empathize I suffer with you. However, responsibility goes beyond feeling sad and expressing compassion; it calls for continued action. I have sought to be a person who speaks, writes, teaches and marches for racial justice in all its forms, and I commit myself again today to that calling. While Dylann Roof may have acted on his own, the attitudes that moved him to do what he did came from a culture that at best tolerates and at worst promotes racism. He may have learned to hate from his family, from a group of friends, or from the numerous White Supremacist organizations on the Internet; it does not matter. As long as such attitudes are given credence, our work is not done. Moreover Roof, like all of us, lives in an American culture that routinely discriminates in education, employment, housing, criminal justice and so many more areas, even as it uses the language of inclusion and equality. As a person of faith and conscience, I will continue to work for the realization of a society where the color of one’s skin is not a target for others’ hate. The 5th century Greek poet Aeschylus wrote: “He who learns must suffer. And even in our sleep pain that cannot forget falls drop by drop upon the heart, and in our own despair, against our will, becomes wisdom to us by the awful grace of God.” By “awful grace of God” he meant “filled with awe.” That is to say that understanding the grace of God lies beyond our full comprehension. I can only hope that this terrible tragedy and the ongoing struggle of what it means to be black in America can be changed as we move to address the racism in our society. Through that ongoing work and struggle, I pray we may grow in Wisdom and experience the Grace of God in ways that moves us forward toward the vision of the Beloved Community for which we long. May my prayers, my thoughts, my compassion, my actions convey in some small way the comfort of God in this sad and terrible time.